Cooler weather and falling leaves means local farms are gearing up their corn mazes for the season. Nothing compares to the nostalgia of a corn maze when the season changes. And in Idaho, there are options for everybody. Whether you’re interested in getting lost in a haunted corn maze with your friends or weaving your way through a more traditional variety, you’ll find only the best in Idaho. Here are our favorites. For the last five years, Magic Valley Corn Maze has provided endless fun to fall lovers in Hansen, Idaho. With games, corn cannons, campfires, a pumpkin patch, petting zoo, and, of course, the corn maze, you’ll find yourself coming back again and again. Make sure to stop by before Halloween! Reopening this October, Quey’s Maze in Mountain Home, Idaho is a fantastic corn maze destination. For the last decade, this maze has been a go-to spot for schools, preschools, daycares, and families. Come experience it for yourself. The folks over at Wild Adventure Corn Maze invite you to lose yourself in over three miles of trails across 10 acres. The maze offers three games throughout to keep things exciting. Make sure to stop by their website to download a $2 off coupon. Twin Oaks Farms in Eagle, Idaho is the proud home of the “Tater Dash Mud Run” and “Halloween Land Corn Maze.” Enjoy hay rides, petting zoo, camp fires, and much more. Call ahead for group pricing information. The Farmstead in Meridian, Idaho offers one of the best corn mazes in the state. Home of “Idaho’s Original Corn Maze,” according to their website, the maze takes up 18 acres of corn and is divided into two sections. The season generally begins in mid-September. Swore Farms is a working farm throughout the year, but each October, it transforms into a maze extravaganza. Swore Farms invites visitors to “test your wits in the educational corn maze, play farm games with treats, get your face painted, see the tractors, and pick out a pumpkin,” according to their website. The maze is only $5—less than half the cost of a movie. 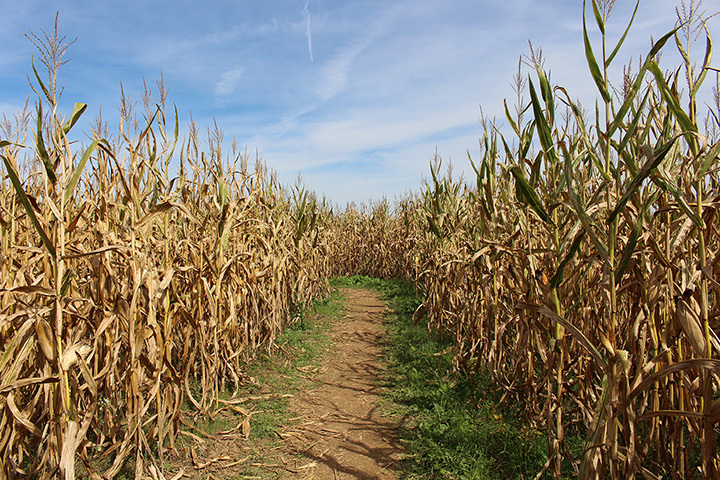 Linder Farms is another Meridian staple, offering a maze with over six miles of trails. The maze is broken into three sections, providing visitors with the choice of a quarter mile all the way up to three miles per trail. One price gets you access to all three. New Sweden Farms in Idaho Falls, Idaho prides themselves on their pumpkin patch, sweet shoppe, and corn maze. The fun begins after Labor Day, with hours starting at 5 p.m. and ending at 9 p.m. on weekdays, noon—10 p.m. on weekends. Family tickets are only $40, or $10 per adult ($5 for kid under 18). Technically, Burley Straw Maze doesn’t offer a corn maze, per say, but their straw maze is just as awesome. Lose yourself among the eight-foot walls of straw as you navigate the twists and turns. Stop by on Saturday to experienced their haunted maze attraction. The Berry Ranch offers fantastic u-pick options in addition to their 1,000-bale straw maze. Once you’ve found your way through, stop by the visit with the animals, pick a pumpkin, and have lunch. View more Idaho Corn Mazes.